- Capacity : 0.075 Ltrs. Our esteemed clients can avail from us the most preferred range of Hydraulic Trainer Basic, Item Code: SAP-38A. Hose Pipes: High-Pressure Hoses with Quick Release Couplings - 8 Nos. All of the components fit securely and safely onto the profile plate. Both sides can be used if required as both sides have grooves. The grooves are compatible with the profile system. Side caps are included. 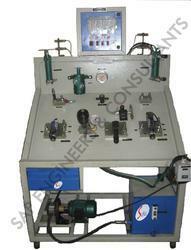 We are an eminent firm affianced in offering an extensive range of Hydraulics Circuit Trainer. 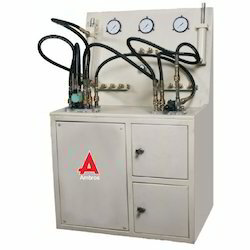 Hydraulic-Electro Hydraulic-PLC based Trainer Kit is designed to train the students with the concept of fully hydraulic and electro-Hydraulic and PLC ladder logic in combination to operate hydraulic , electro-hydraulic and PLC based logical sequencing hydrauliccircuits .All the three kind of logics can be performed on this kit. Unit Is Complete With Main Frame Supported On Castor Wheels. A Slanted Ms Plate Working Panel Is Fitted With All Components. Electrical Supply, Switches Starters, Pressure Gauges Are Mounted Next To Working Panel. A Hydraulic Power Pack With All Necessary Fittings Are Provided. Circuit Can Be Built Easily By Using Quick Couplings. Hydraulic Hoses With Quick Couplings Are Also Provided. This trainer is designed for students to get familiarize with real life to factory automation system. Material handling is understood. HVK has the capability to source, for a given circuit, the entire range of products. This ensures that clients do not have to look to a number of vendors for each of their requirements in hydraulics. HVK has already put this into action with a few of its OE customers in its territory and the benefits have been visible for all to see.